It is one of the most worrisome observations: fast massive death of coral reefs. A severe wide-scale bleaching occurred in the Philippines leaving 95 percent of the corals dead. The bleaching happened as the result of the 2009-2010 El Niño, with the Indian Ocean and Southeast Asia waters experiencing significant thermal increase especially since the beginning of 2010. In one of our conservation sites prior to the bleaching event, dead coral represented only 20 percent of all corals, after bleaching that percentage rose to 95 percent of corals. The dominant live coral morphologies on the reef flat included branching, encrusting and foliose forms (Acropora and Montipora species) followed by sub-massive and massive Porites species. The crest had a slightly lower percentage of encrusting and massive forms, and an increased percentage of tabulate and corymbose forms. In contrast, slope regions were dominated by foliose (Montipora species). 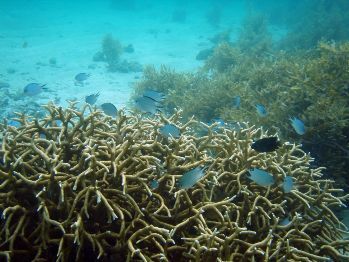 Now, the majority of the coral are dead and are mostly covered by algae while some are already showing signs of rubble. The bleaching has been observed at many other sites around the Philippines featuring mass mortality of corals including the coral triangle outside the Philippines. This environmental catastrophe will probably be considered the most damaging bleaching event ever recorded in the Philippines, surpassing the big one of 1998. During bleaching events, corals loss the symbiotic algae (known as zooxanthellae) which causes the coral to look white as the limestone skeleton becomes visible. Corals that are not able to recover from bleaching will die and eventually break down. While corals can recover from bleaching, extreme or long exposure to temperature anomalies cause significant mortality. Recoveries are strongly influenced by human disturbances such as overfishing and water pollution. The consequence of this large-scale event is far from being fully known but fish diversity and populations will be highly affected. Livelihood depending on small sustainable fishing activities will see their income significantly reduced. Tourism will suffer greatly and tourists activities to replace diving will be needed. Prior to this year’s bleaching, it was estimated that about 85 percent of the reefs have been damaged or destroyed in the Philippines, now the current estimate is likely to be close to 95 percent. Millepora coral in the Philippines prior to bleaching event. Photo courtesy of Pierre Fidenci. Posted on April 11, 2011, in Uncategorized. Bookmark the permalink. Leave a comment.